Cobra Microphone for Aviation and Professional Racing. 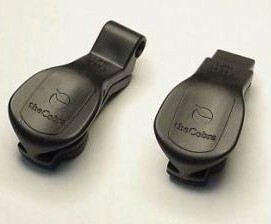 theCobra has an average 10 dB improvement over the M-87 with a maximum of 30 db improvement in average speech bandwidth. Suited for use in car racing, any aviation and many military applications. theCobra'sTM noise rejection performance surpasses all passive or active micro-phonic systems including 2-port, 2-active and array microphone designs. The difference is particularly stark in high noise levels. UmeVoice's patented noise cancellation technology rejects extraneous background noise. An acoustically based approach; theCobraTM accentuates the speaker's voice by concentrating it on the front port of a two-port microphone, while deflecting background noise from the back port. We can custom mount this microphone to many different applications including motorcycle helmets and pilot headsets. Electret (E-Cobra) or Dynamic (D-Cobra). Amplifier boosts Mic output by 10 db.